Hi! Today I am sharing the little treat bags I made for On Stage friends. I had so much fun putting them together! These little bags are made using the Gift Bag Punch board – a medium sized bag. 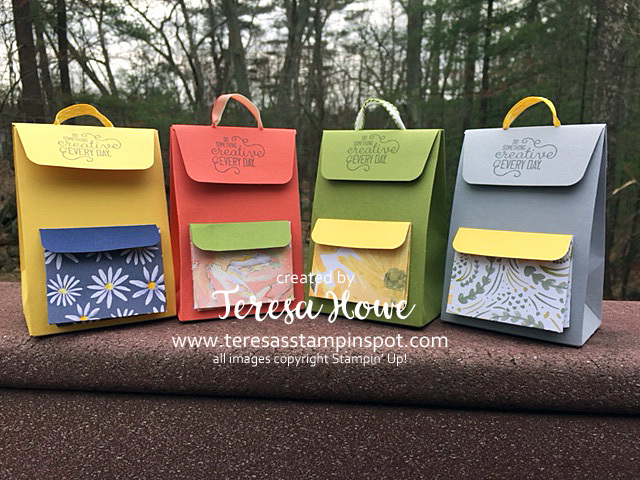 A little front pocket was made using the Delightful Daisy Designer Series Paper. The top flaps are a separate piece from the bag. I didn’t snag a picture of the back, but there are two ribbons that act as straps for back of the little backpack. A few little treats, post-it flags, and a mini pen. I think everyone liked them! Use the 1/8″ hole punch to punch two holes on the back of the bag above the bottom flap. Cut two pieces of ribbon 7″ long and knot one end. Run these through the holes so the knot will be on the inside of the bag. For the top flap, cut a piece of cardstock 3 1/8″ x 2 1/2″. Score at 1 1/2″ on the 2 1/2″ side. Punch two holes on the score line 1″ in from each end. Use a 3″ piece of ribbon through these two holes to create the handle on the top. Adhere ends down with Tear & Tape to the smaller section created by the score line. 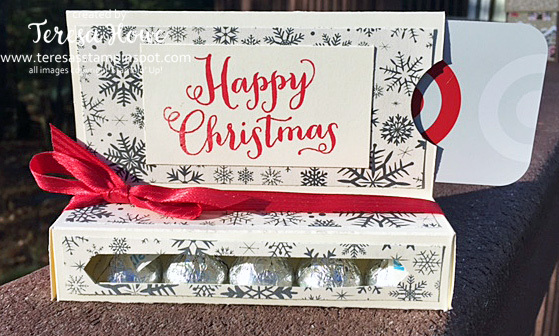 Use the gift bag punch board to just punch the two ends of the cardstock to create the flap. Punch a hole in the middle of the 1″ side created by the score line for the two ribbons to fit through. Adhere these two ends down using Tear & Tape. Attach this 1″ section to the back of the bag to adhere the flap. For the front pocket, cut a piece of Designer Series Paper 4″ x 2 3/4″. Score the 4″ side at 1/4″, 1/2″, 3/4″ 3 1/4″, 3 1/2″ and 3 3/4″. Score the 2 3/4″ side at 1/4″ , 1/2″ and 3/4″. Cut off the two corners where the score lines intersect. Fold score lines mountain, valley, mountain and use Mono Multi Glue to attach the three sides to the front of the bag. For the flap, cut a piece of cardstock at 2 1/2″ x 1 1/4″. Score the 1 1/4″ at 3/4″. Round the corners on the front and use Tear & Tape to attach the little flap to the front of the bag with the fold over the little pocket. Use small pieces of Velcro to hold the two flaps down. Don’t forget, the retirement list is out! Items are starting to sell out – so don’t delay in getting those orders in – I’d hate for you to not get what you want! Is this not just the sweetest? Thanks to Dawn Griffin for her video on how to make these. For my version, I used Very Vanilla for my base and the snowflake sheet from This Christmas Designer Series Paper pack. I used the Classic Label punch to create my window. The sentiment is from the Oh, What Fun! stamp set. A little Real Red ribbon, and there you go. Did you notice the little notch in top? You can slide a Gift Card into the opening! These are pretty easy to make, too! I’ll be making more as I think these are perfect for bus drivers, teachers, the mail man and of course the UPS person who delivers my Stampin’ Up! goodies! I hope you’ll give these cute boxes a try! PS – Don’t forget about the Year End Closeout Sale! You’ll find tons of great deals in my on-line store. Hi! How are you today? I hope all is going well for you! 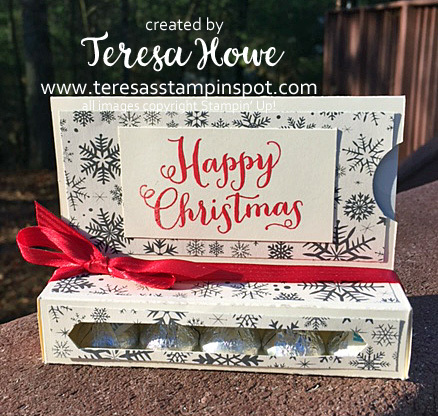 Thanks to Lynn Ellis of Stamp With Peg for her photo tutorial. 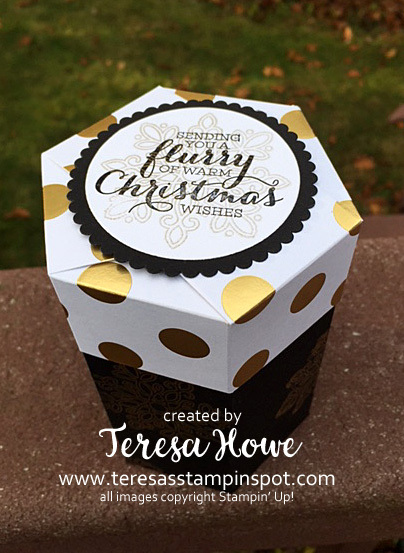 I used the Flurry of Wishes stamp set – and embossed the snowflake with Gold Embossing Powder. 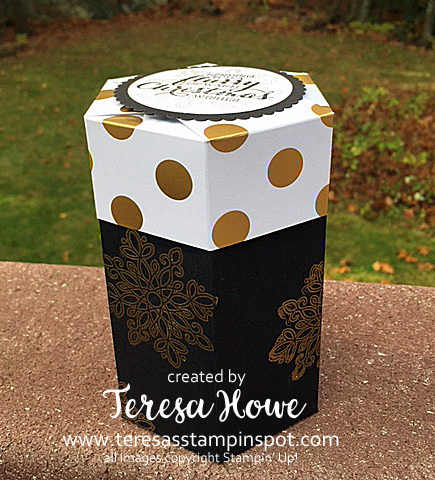 The lid was made using the specialty sheet from the Pop of Pink Designer Series Paper pack. Stamp a snowflake in Crumb Cake ink, then stamp the sentiment in Basic Black Archival ink. Once you have attached the side tab for the top, put the lid on the bottom of the box to form the top – easier to get the shape you need and to make sure the lid fits. I hope you enjoyed today’s project. These are perfect for holding an ornament or some treats for your holiday gift giving. Don’t forget, today, November 10, is the last day to sign-up for Paper Pumpkin to receive this special edition box! If you are not a subscriber, consider joining for 1-month to see what it’s all about! 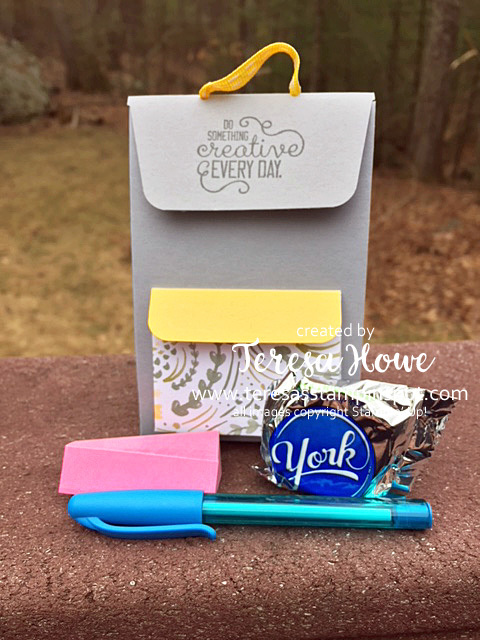 Just $19.95 (US) plus tax gets you a little box of creativity shipped right to your door! Here’s the link if you wish to give it a try.